1957 brought a bold new look to Ford trucks. It also brought some big changes and buyer choices. The 1957 trucks were roomier than the 1956 Ford Trucks. One of the major changes for 1957 was that Ford truck buyers now had the choice between two box styles. In the past buyers knew a truck had a box with some fenders mounted on them. The newly available Styleside bed allowed truck owners to carry more cargo. The smoother, larger box looked different and the old fendered box was called the Flareside. Both boxes were priced the same and were available in 6.5 or 8 foot lengths. There was also a new Y-block V-8 engine with 272 cubic inches of displacement, 167 horsepower and 260 lb-ft. of torque. You could also get a 223 cubic inch six cylinder. 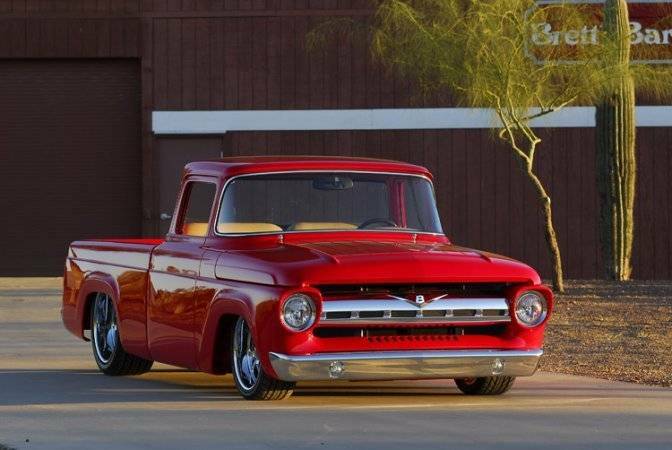 We found this video on YouTube of a '57 F-100 in excellent condition. We are not affiliated with the producer of this video. The photos of the red '57 on this page are used with permission from Steve's Auto Restorations.